Who can't recite at least two or three Shel Silverstein poems, or at least parts of them? "There is a place where the sidewalk ends, but before the street begins..."
"Listen to the mustn'ts, child, listen to the don'ts..."
"I will not play at tug o' war, I'd rather play at hug o' war..."
"So I'm all of love that could make it today." "There's a polar bear, in our Frigidaire..."
Silverstein died in 1999, but believe it or not, there will be a new collection of his work coming out in 2011. 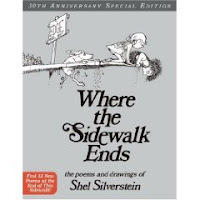 I think I'm going to have to buy "Where the Sidewalk Ends" and start reading the poems to Kelly. Two isn't too young to meet him, I don't think. "The bridge will only take you halfway there, to those mysterious lands you long to see. Through gypsy camps and swirling Arab fair, and moonlit woods where unicorns run free. So come and walk awhile with me and share the twisting trails and wondrous worlds I've known. But this bridge will only take you halfway there. The last few steps you have to take alone." I love Shel Silverstein and so was thrilled when I found out (only recently) he also authored all my favourite Dr. Hook and the Medicine Show songs...Penicillin Penny, Freakers' Ball, and the list goes on and on! I've always loved Shel. My 9 year old is just begining to appreciate him and has made it his mission to find and read everything he's written. Where the Sidewalk Ends is one of the fondest memories of grade school for me. All my teachers read it to us.